These free pumpkin clip art images are going to look great on whatever you're creating this Halloween, whether you're printing them out or using them online. Add them to a Halloween card, party invitation, flyer, or whatever else you're creating. All of this pumpkin clip art is free to use on all your personal projects. If you plan on using the pumpkin clip art commercially, you'll need to check with each website for whether you're allowed to use the images in that way. 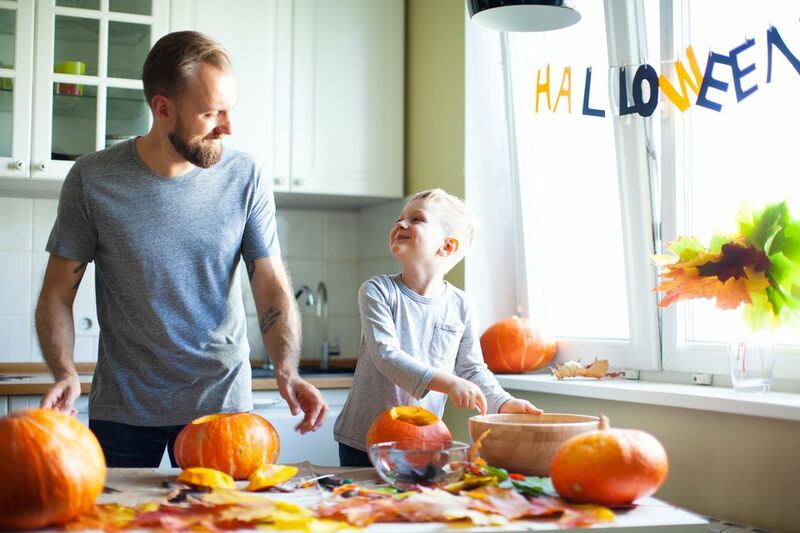 A search at Clker.com comes up with hundreds of free pumpkin and autumn-themed clip art, each of which is available as small, medium, or large PNGs or an SVG file. There are pumpkin clip art pictures of jack o' lanterns, pumpkin pie, vines, Halloween banners, leaves, and more. There are several pages of images at Clker.com, so make sure you look through all of them to find something unique. Webweaver's has some great pumpkin clip art. Around 20 of them! There are jack o' lanterns, pumpkin scarecrows, pumpkins with bats, pumpkins with moons, and even a pumpkin angel. Most of these pumpkin pictures are in the PNG image format, but the animated ones will save as GIFs. Looking for pirate pumpkins, android pumpkins, or even ninja pumpkins? Openclipart has several dozen high-quality pumpkin clip art you can download in small, medium, or large PNGs as well as in the PDF format and WMF document format. You can even edit these pumpkin images online before you download them, but be sure to look through all the different pages of pumpkin clip art at Openclipart before moving down this list. If you're looking for some free vector pumpkin clip art, then look no further than 123Freevectors. There are over 200 pumpkin images you can download here. Many of them are downloaded from other websites, so you'll be taken through a few links before you can find the actual download link. These pumpkin images are in the AI file format. Clipart Panda offers several dozen free pumpkin clip art pictures, and most of them are rather large, making them perfect for any project. They are also fairly straightforward: the pumpkins look like pumpkins and not like (for example) pumpkin ghosts or pumpkin pirates. Each download page shows how many times the image has been opened on Clipart Panda, how many times it's been downloaded, the file type the file's in (e.g., PNG), and the dimensions of the full image once you download it. Cliparting has 60+ free pumpkin clip art images of groups of pumpkins, single pumpkins, pumpkins still planted, pumpkins with leaves, jack o' lanterns, and even pumpkin pie. To get the highest quality image, click on the thumbnail once and then right-click to save the pumpkin. This collection of pumpkin clip art at Backyard Gardner is a wonderful find. You'll discover all different sizes, shapes, and styles of pumpkin clip art here as well as a lot of other pumpkin fun. Some of these images animated GIFs while others are still images. You'll find 10 pages of pumpkin clip art over at Hellas Multimedia. Some are simple, while others are complex and beautiful illustrations. You'll also find a wide range of animated pumpkins, ranging from the fierce to the fanciful. The pumpkin clip art images at Free Clip Art Now are a nice mix of black and white and colored images. Click on the pumpkin clip art image once to get more details about the download including its resolution and file size. Visit all seven pages of Clips Ahoy's collection of pumpkin clip art or view specific categories like clip art images of carved pumpkins or even pumpkin pie. Be sure to click twice on the pumpkin clip art you want to download to get the biggest image available, and then right-click it (if you're on a PC) to choose to save it to your computer.